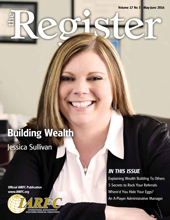 The International Association of Registered Financial Consultants (IARFC) features Jessica Sullivan, RFC® in the current issue of the Register. As a partner of Mahoney & Sullivan in East Concord, NY, Jessica focuses on “Building Wealth” for whatever the life stage of her clients. Jessica’s educational background emphasizes her pursuit of excellence in the foundation of her career path. Along with an Associate’s degree in Accounting and a Bachelor’s in Financial Planning, she has completed the requirements for securities as well as LTC licenses. Part of building a workable and successful plan is adapting the current life phase of their clients to the expectation of the results. These life phases start with young couples or single adults and their investment opportunities and challenges. It continue as these entities build their wealth by work and progress in their lives and finally as they prepare for retirement. Her firm also includes crafting financial roadmaps for small to medium sized businesses. While similar to personal planning, a business roadmap to building wealth encompasses additional aspects such as company goals, continuation plans, and debt cancellation strategies. Jessica is fortunate to work alongside two partners and an advisor, who between the three of them have over 100 years of experience and wisdom from which to draw. She has taken in so much from their teaching and continues to do so on a daily basis. She acknowledges to her clients how much these mentors have influenced her planning style and how closely they work with each other. “Jessica is definitely on an upward moving career path, states IARFC Chairman H. Stephen Bailey of HB Financial in Charlotte, NC. “As a Registered Financial Consultant (RFC®) and a member of our Association, the clients are assured that she is holding herself to a higher standard to ultimately better serve them.” To read the entire interview with Jessica Sullivan, RFC®, visit http://www.iarfc.org.